From the outside looking in, Kelle Hampton had the perfect life: a beautiful two-year-old daughter, a loving husband, a thriving photography career, and great friends. When she learned she was pregnant with her second child, she and her husband, Brett, were ecstatic. Her pregnancy went smoothly and the ultrasounds showed a beautiful, healthy, high-kicking baby girl. But when he new daughter was placed in her arms in the delivery room, Kelle knew instantly that something was wrong. Nella looked different than her two-year-old sister, Lainey, had at birth. As she watched friends and family celebrate with champagne toasts and endless photographs, a terrified Kelle was certain that Nella had Down syndrome - a fear her pediatrician soon confirmed. Yet gradually Kelle's fear and pain were vanquished by joy, as she embraced the realization that she had been chosen to experience an extraordinary and special gift. 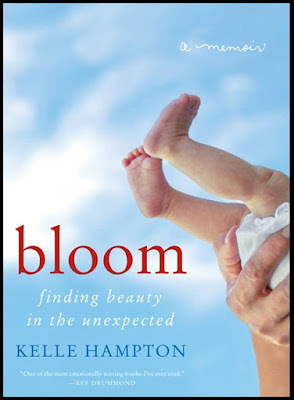 Bloom takes readers on a wondrous journey through Nella's first year of life - a gripping, hilarious, and intensely poignant trip of transformation in which a mother learns that perfection comes in all different shapes. It is a story about embracing life and really living it, of bearing fearless and accepting difference, of going beyond constricting definitions of beauty, and of the awesome power of perspective. As Kelle writes, "There is us. Our Family. We will embrace this beauty and make something of it. We will hold our precious gift and know that we are lucky." I don't know why I still had this book. It was something I had picked up in 2013 at a 25¢ thrift store sale. The cover intrigued me, but reading the jacket told me this was nothing like my normal book interests. Nonetheless, I threw (gingerly placed) the book in my cart and brought it home. Almost four years later I finally picked up the book and consumed it in its entirety in one seating. Bloom is a first-person account of a mother's internal battle between the daughter she wanted and the daughter she got. Hampton presents a very real and raw account of discovering that Nella has Down syndrome, sharing with her audience what she believes to be her weakest moments as a mother. Kelle spends the first 106 pages (or 39% of the book) recounting the first few days of Nella's life and her stay in the hospital. During the hardest moments in her recounting, she takes breaks to recount other, happier times in her life; her oldest daughter's birth, meeting her husband, various "unmotherly" things she did in her younger years. The rest of the book is spent recounting Kelle's accomplishments in Nella's first year of life, including speaking at the 2010 National Down Syndrome Congress convention. I would have to disagree with the jacket's declaration that this is a "wondrous journey through Nella's first year of life." A more accurate statement would be "this is the journey Kelle took during Nella's first year of life." I was disappointed when I realized that this book was more about Kelle than Nella. Once I adjusted my expectations, it became a more enjoyable read. I wanted to love this book. It's obvious Kelle put a lot of heart and soul into it. Between the super long play-by-play of her hospital stay and the ever constant presence of idealistic always-there-for-you moments brought on by her nationwide circle of friends, or her Net, it was hard for me to follow. The way each and every friend breaks down sobbing when they finally see Kelle because of some presumed tragic diagnosis comes across as disingenuous. I'm a cynic at heart, and I know this. My life is very dissimilar to Kelle's, and it makes what her reality is seem very foreign to me. I don't have a large circle of friends to lean on the way Kelle does, so to read about a very large circle of people providing support to a friend in need seems like fantasy. I've never been a mother, so I can't possibly understand all of the emotions that come with giving birth. Nor can I understand the heartbreak and self hatred that comes with the trials and tribulations of having a special needs child. Kelle did a wonderful job of communication that battle. With all these difficulties, I still found myself enjoying parts. Kelle's writing style is very reflective of conversations between close friends, complete with random tangents and a humorous quip in the middle of a sentence. I found myself laughing at her early 20's shenanigans and silly moments with her husband. I'm not the target demographic for this book, and it shows with my difficulty in empathizing with Kelle's story. It definitely gave me a lot of food for thought, though, and I thank her for that. I may have not been able to love this book, but I definitely liked it. I feel like this is a book that would be very good to go back to if I ever take that step into motherhood.